The Boogies with Gravity & Other Myths is a production company that understands the theatre of theatre. Firstly, the ritual of the audience gathering as a group to wait for admission into the Empire Theatre tent, is enhanced by having everybody remove their shoes and socks and step onto a large, circular, vinyl mat to wait for the doors to open. Then, as the audience files into the performance space, Jascha Boyce and Joren Dawson (our performers) gently take our shoes and hang them on a rack Ikea would be proud of. Children can be heard talking about their brains in the soundtrack that is playing while we all find a place to sit and prepare for this spectacle. And then, the physical theatre begins. 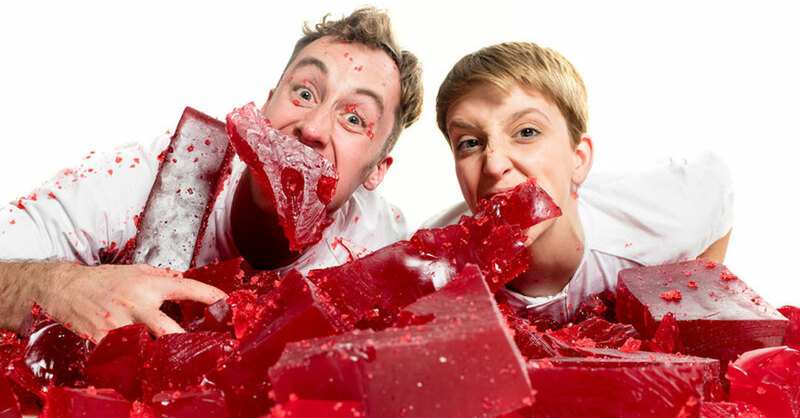 Jascha and Joren are immediately likeable as they push themselves through 40-odd minutes of interaction with two pouf-sized blobs of jelly. Or is it jam? This reviewer didn’t quite get the promised profundity of “acrobatic adventure into the brains of young humans … [with] interviews with kids … [inspiring] people, young and old, to ask the question ‘what makes you, you?’” Unless, of course, we simply count the liberal sprinkling of the word “amygdala”, dotted frequently through the recordings of children in the soundtrack. Instead, this show was a celebration of curiosity, wonder, exploration, and of being completely present and physically in touch with the world around us. The physical strength of the performers is one thing, but to see Jascha regroup and successfully redo one or two treacherous manoeuvres that had initially misfired, speaks to the psychological strength and discipline of this husband and wife duo. Children in the audience we entranced throughout the show, thanks to its structure and pacing, and adults were most likely in awe, both of the skills but also of the seemingly unbreakable bond these two performers must have in their relationship, as a result of creating this work that demands such intense focus and trust between them both. In the end, jelly or jam is not really the question. Rather, this piece is the poetry of movement. In this show, finding a question, any question, and then investigating it with one’s whole self, with all our senses and with physical exertion, is the take home message we are left to ponder, as we wander out, squishing our toes into the red “stuff” now littered across the stage.